The gray/neon-green, limited edition Korg Kross 2 is a mobile synthesizer workstation with a 61-key, velocity-sensitive keyboard. Combining a synth, sequencer, sampler, recorder, and audio interface in one compact and lightweight unit, it provides musicians and composers alike with the tools for writing and recording original music, or for performing as a "one-man band" or in a group. 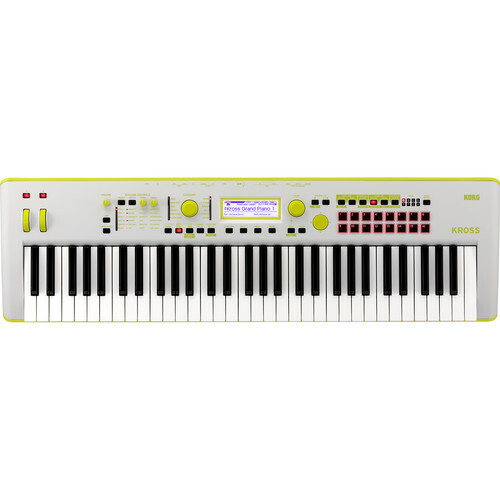 In addition to the neon color, this model has additional PCM that provides special pre-installed piano and electric piano sounds, as well as synth and drum sounds that meet the needs of cutting edge EDM (electronic dance music) producers.